Jamaat-e-Islami Bangladesh called for a protest rally in the city of Kotchandpur thana of Jhenaidah district. When the procession reached the market premises while crossing the city road, the terrorist group of Chhatra Dal carried out an ambush on the procession. 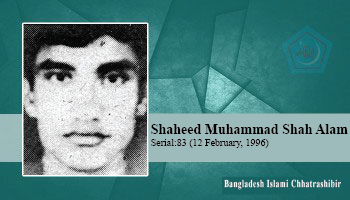 Shaheed Shah Alam died from his injuries after being attacked by sticks, rods, bricks by the ambushers. He passed away while being taken to Jhenaidah Sadar hospital on motorcycle. 48/1, Purana paltan, Dhaka-1000, Bangladesh.